Did Julian Assange's Mom Implicate Seth Rich In DNC Leak? It seems that Christine Assange, mother of Wikileaks founder Julian Assange, set the internet buzzing when she appeared to imply that murdered Democratic National Committee staffer Seth Rich was the person who leaked DNC emails and other documents to Wikileaks. "Why did Julian publish damning docs against Hillary at such a crucial time which gave Humpty Dumpty Trump the upper hand?" Christine Assange was asked by a person on Twitter. 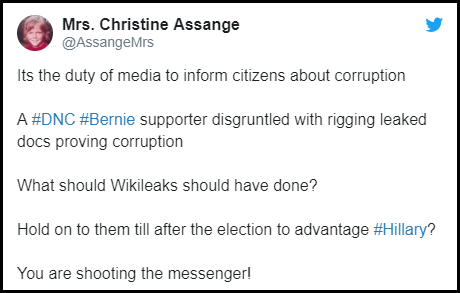 Assange replied "Its the duty of media to inform citizens about corruption," and added "a #DNC #Bernie supporter disgruntled with rigging leaked docs proving corruption." "What should Wikileaks should have done?" she continued. "Hold on to them till after the election to advantage #Hillary? You are shooting the messenger!" Many drew the conclusion, based on her comments, that the leaker was Seth Rich, though she never said that. Still, her son, Jullian, all but indicated that Rich was the leaker. On July 12, 2016, DNC staffer Seth Rich was murdered while reportedly walking home at 4am. Though robbery was initially suspected, Rich still had his wallet and watch when police arrived. The murder – one of five tied to the Clintons in the last six weeks – came in the midst of a massive email leak scandal involving Wikileaks, Hillary Clinton and the Democratic National Committee. Though the reports were initially dismissed as conspiracy theory, perhaps the one person who could confirm that Rich was, in fact, a whistleblower may have just done so. Yet, Assange's mother later deleted her tweet and wrote people had wrongfully asserted "Julians mother confirms its #SethRich." She followed it up with the fact that she claims to have met the person who leaked the documents. Furthermore, she goes on to blast anyone that thinks it was the Russians and a hacking job. It was an inside job. Many on Twitter wrongly proclaimed that she stated the Rich was the informant. However, let's backtrack with a few articles that seem to indicate that Rich was, in fact, the leaker. I'll let the people be the judge of the facts, but all indicators point to the fact that Rich was the leaker and that he was murdered because of it. Previous If You Haven't Laughed At The Ignorance Of Alexandria Ocasio-Cortez Lately, Then Take A Look At This!